At Teen Line, we call our teens who answer our hotline “listeners.” Not peer counselors, not advice givers, but “listeners.” Why “listeners?” Because we fully believe in the power of listening in building a relationship or helping someone through their problems. Through listening, we understand the experience of our caller, and create a sacred space. There are several roadblocks to good listening. We’ve talked about some of these things before, but it’s always a good reminder. The first is being judgmental. When we judge our teen or what they have to say, we stop listening to what they are actually saying and only see them through the lens of our judgment. They don’t feel respected or heard, and we don’t see the possible value of what they have to say. 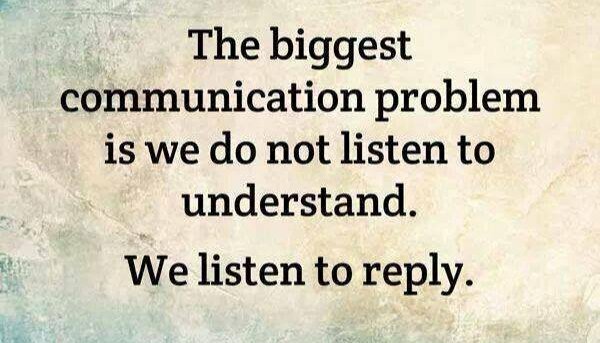 Giving advice is also not listening. It’s rushing in to fix a problem, and sending the message that they can’t solve it themselves. The recipient feels less than, and their feelings never get a chance to be released. Taking the other side is also not good listening. When your teen is in a moment of need, they don’t need you to point out what they might have done wrong. They need to feel that you are on their side. Think of how you might feel if your friend or partner wonders aloud what you might have done to create a situation. Changing the subject also hurts communication, and is generally about our discomfort with the subject matter. Some of the things our teens bring up are difficult to hear, but not talking about them doesn’t make them go away; it just sends the message to your teen that you can’t handle it. It’s giving our full focus to our teen. Putting our phones down or turning the TV off, and not interrupting with our agendas. It’s asking open ended questions (not interrogating), like “tell me more,” or “what was the best part of your day?” and waiting for the response. It’s being comfortable with silence and not always having the answers. When appropriate, it’s also remembering the power of a hug. (Refer to Brene Brown clip ). I encourage you to be mindful of your listening skills this week, and see if there is a positive impact on your relationships. Wonderful and listening is so hard for me to do! I will work on my empathy skills. Thanks!